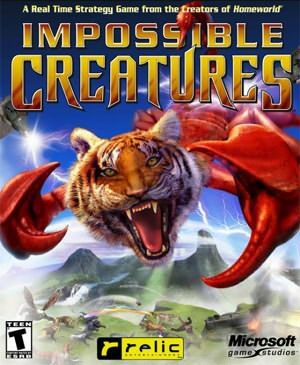 "Impossible Creatures is a game that takes the Island of Island of Dr. Moir�, Jurassic Park and gene splices it with Warcraft 3, resulting in a real-time strategy game that allows you to create some of the most bizarre creatures to have ever engaged in battle!" In Impossible Creatures, you play the role of Rex Chance, a 1930's adventurer who is trying to track down his long-lost father. By searching the world for your father, you eventually stumble upon where your father once lived, a secluded island in the South Pacific. As you investigate, you discover that your father was forced to create genetically engineered animals for a madman named Upton Julius. In order to save the world from this madman and avenge your father, you team up with Lucy Willing, a colleague of your father who vows to help end this madness. Although the story sounds straight out of a 1930's pulp fiction novel, this is where the beauty of Impossible Creatures starts. As with all good real-time strategy (RTS) games, there are a number of different gameplay modes that include campaign, skirmish and multiplayer modes. 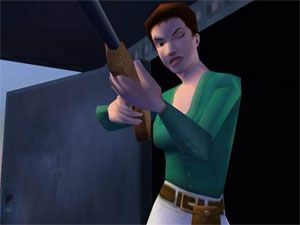 The single-player campaign mode is based around the adventures of Rex Chance who must somehow defeat Upton Julius. Your first mission has you scavenging the island for DNA in order to create your very own creatures. Once you have started developing new forms of life, you will eventually engage the enemy which is where the game truly shines as you can see how well your creatures perform and hopefully improve them on the next mission. There are various cut scenes throughout the campaign mode that tell both sides of the story, that of Rex Chance and the insidious madman Upton Julius that helps progress the games story. The developers of Impossible Creatures boasts that it is possible to create over 40,000 different types of units, although it should be noted that many of these units are virtually identical but just look different. In order to create creatures, you must tag the animals you encounter and with this information, you have their genetic blueprint that allows you to splice, dice and create your own wondrous beasts. 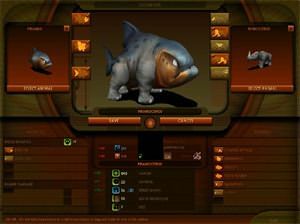 Every animal-hybrid that you create in Impossible Creatures has various attributes such as aggressiveness, combat, speed, regeneration and a whole variety of other attributes that allows you to specialize your units. To keep the game fair, all these units come at a price and the more strange and powerful the creature is, the higher the cost and research levels are required to create the animal. You are also given three different creature creation chambers to help with the research of the animals, these include land, air and water but it is possible to create units of two chambers. When your unit is finally created, you can also modify the body parts of the creature that allows you to make some impressive, laughable and quite bizarre creatures. The control system of the game is quite straight forward and uses similar controls as with other real-time strategy games such as Warcraft 3 and Age of Empires. The main control device is the mouse, although the keyboard can also be used. You must tag, drag and move your units to various parts of the map and by clicking on enemy units, you will engage them. When it comes to combat, the artificial intelligence is a little predictable at times and although not as difficult as other RTS's, the game can be quite challenging at times. That said, the combat is also well executed and if you don't defend yourself early on in the game, you could be facing the legions of Upton Julius and be in a whole world of hurt. When your mission starts, you always start with a laboratory that allows you to build a variety of different buildings. In order to upgrade and create animals, you must bring back two types of resources to your base, these include coal and electricity. Graphically, Impossible Creatures is an awe inspiring game that fully utilizes today's 3D card market and gives the user some spectacular and colourful graphics. All the units in the game look like some bizarre Stephen King creature that are extremely well animated and look quite realistic, if you can believe that you can merge a bull with an eagle, then this is the game that does it. The 3D engine allows you to zoom straight into the action and see your creations fight with the opposing enemy forces which is actually quite impressive, considering how sparse the Empire Earth battles were. Apart from the well detailed units in the game, all the buildings have this authentic 1930's look to them that helps set the genre of the game that could almost become a pulp fiction classic of the modern age. All the terrains and various backgrounds in the game come together perfectly and actually make you feel like you are on a South Pacific Island that has gone horribly wrong. 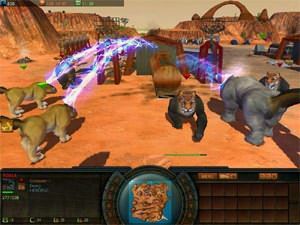 When it comes to sound, Impossible Creatures contains all the various sound effects you would hopefully expect to hear in a South Pacific jungle and the developers have even done an extremely good job at recreating the different types of environments, such as the oceans, jungles and the colder climates. All the creatures in the game have a variety of different and unusual sound effects that includes screams, grunts, howls and roars. Musically, Impossible Creatures contains a 1930's style of music that sounds like a cross between jazz and big band that helps with the games atmosphere. The voice acting of the game sounds straight out of a Sunday matinee serial and although some of the acting is over the top and sometimes a little laughable, it actually fits in well with the rest of the game. Impossible Creatures is the perfect game for fans of real-time strategy games that want a different perspective that don't include futuristic or World War II weaponry. Impossible creatures is far from that as it is a refreshing change. The game contains some of the best graphics to have ever graced a RTS that goes hand-in-hand with an awesome storyline and some great music. Highly Recommended!